Robots and lasers have a long history together. 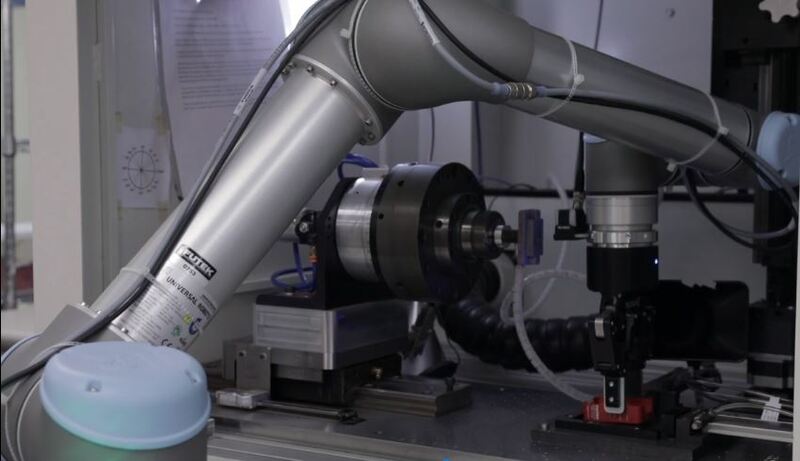 Now, cost-effective, easy-to-use cobots and new lower-cost lasers are a perfect match for a wide range of engraving and marking applications. “Nowadays, everything requires a number,” explains Victor Amorim, Western Territory Manager for Gravotech, a global provider of marking and engraving equipment. Amorim uses the 2010 Deepwater Horizon oil spill as an example, explaining that the lack of traceability numbers prevented BP from being able to point fingers at its contractors. Today, nearly everything that is fabricated requires marks to identify manufacturer, part number, date codes, or serial numbers for traceability as well as warranty information. Gravotech recently demonstrated new automated laser and dot peen marking solutions using a UR5 robot. Depending on the type of part and the type of mark required, the UR5 automatically places parts inside a Gravotech LW2 Class 1 laser enclosure for marking with an F30 fiber laser, or places a part under the XF510CP dot peen marker. The UR robot is fast, precise, adaptable, and easy to control, and allows on-the-fly programming changes with the touchscreen interface. And with built-in safety sensors, it can work safely beside human workers for inspection or related processes. Ostling is another global provider of marking systems who is demonstrating an excess diode pump solid-state laser marking system automated with a UR robot. Brian Watts, Ostling Product Support Manager, explains that the robot manages full control for z-axis focusing as well as rotational control and location for the laser-marking process. 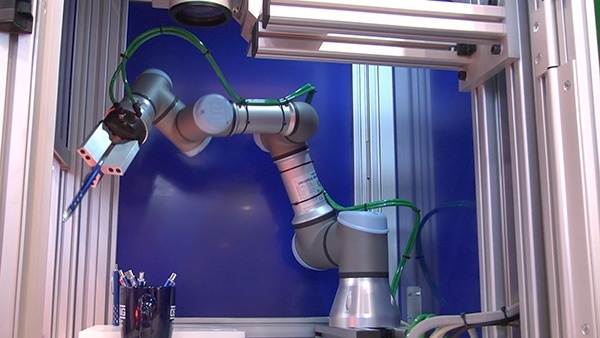 The robot can also be incorporated with a vision system to do visual inspections for the mark, or to use the system for cutting or welding. 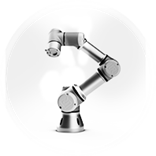 The UR3 robot manages full control for z-axis focusing as well as rotational control and location for the laser-marking process. Ostling sees great potential for the turnkey system, especially for high-volume marking applications that are difficult for an operator to provide consistency and repeatability, and that present ergonomic challenges for human workers. The Ostling system is ideal for medical marking, which must be done in Class 10,000 clean rooms with no human interaction with the parts at all. For these applications, the part can be picked up and inspected by the robot, using a vision system to identify the location for the mark, so no human workers are involved. Beyond medical, Ostling is seeing interest from the aerospace industry, where the robot can work nearly non-stop without the potential of human contamination of delicate parts, as well as the automotive industry. While these systems are being demonstrated now, other automated robot-laser systems are successfully in production—some in surprising applications. The Ring Lord built its business in the chain mail supply industry, producing a million “jump rings” every day. These small wire rings are also used to link charms and other jewelry components. This growing company has adapted multiple times to maintain its growth, and has moved into laser engraving, which it is now automating. At FUTEK in Southern California, a provider of test and measurement tools, a UR5 robot feeds amplifier casings into a laser engraving machine. Mechanical engineer at FUTEK, Javier Ruiz, says that the UR5 has increased production by 40-50% and has optimized the use of existent work force. “Because it takes 7 minutes to engrave a part, it is less efficient to have a dedicated staff member monitoring the process. That labor has been reallocated to other parts of the production line, and we can have the robot running a 3rd shift,” explains Ruiz who also emphasizes how the product quality has increased with the exact repeatability of the robot.